We are thankful for you, our customers and blog-readers and friends. We hope you have a very special Thanksgiving Day tomorrow! Don’t forget that Small Business Saturday comes right on the heels of Thanksgiving! This is a fantastic way to stretch your shopping dollars AND support small businesses. This year, we’re giving thanks for you by rolling Thanksgiving and Small Business Saturday into one long-weekend-long gift. Shop our online store and enjoy FREE SHIPPING to any US location. Plus, save 10% on your entire order by using coupon code SBS2018. The next time you take a break, go to www.smithfamilyresources.com and shop small and save big! THANK YOU from the Smith family! Don’t you love this very Helena-esque design for our Independence Day shirts?? Available in white comfort colors and dry-fit, from Youth Small all the way to Adult 3XL. Adult shirts are $20, youth sizes $15. You can drop by Alterations by George to get yours, or you can message us to arrange for local pick-up or delivery. Reserve your shirts by commenting on this post or by emailing us at smithfamresources@att.net. Helena Fireworks, Tuesday, July 3, 9:00 p.m.
Wright Construction Company of Birmingham Inc.
After my last post, a friend wanted to know more about Rose Hips. She had visited a website that raised questions about possible deterioration of the Vitamin C during processing and storage. I asked Stephanie Tallent of Beeyoutiful for her insights and I thought you might enjoy reading her response. “First of all, Beeyoutiful’s Rosehip C has both the whole Rosehips ground up in it as well as other forms of isolated stabilized Vitamin C. That being said, the amounts on the label are the guaranteed, tested, stable potency and quantity all the way through till the best use by date printed on each bottle. “Second of all, while nutrients do indeed deteriorate in whole food supplements under certain manufacturing conditions such as high heat exposure/open to oxygen storage along with many other factors, there is still in my opinion value in including whole food forms of nutrients in formulations. Our bodies are designed to recognize and utilize nutrients *from food* and it is my personal belief that absorption of all nutrients are optimized when it is taken in conjunction with whole food. “We carry several forms of Vitamin C . . . and have had years to use the different forms ourselves and to get feedback from our customers. I personally feel as though the Rosehip C formulation works more effectively for my body than formulations that do not contain whole foods. “Obviously, there aren’t slews of studies documenting the nuances of absorptions between all doses, all forms (although maybe one day soon! Studies are ever increasingly being done with nutritional supplementation) but for now what we do know that is absolutely documented and tested to be fact are the types and potencies tested. On another note, it’s easy to reach for those Vitamin C powders that are available in almost every pharmacy and grocery store. Before you bring it home, read the ingredients. Most of these contain SUGAR which most people avoid when trying to prevent sickness. Rosehip C contains no sugar- another good reason to consider adding it to your regimen for staying well! Click here to purchase Rosehip C.
In case you ever wondered if roses have fruit, the answer is yes. The fruit of the rose is the beautiful rose hip. Most modern roses don’t produce rose hips, but they are commonly found on rugosa roses (Rosa Rugosa) and dog roses (Rosa Canina). The rose hip pictured here is courtesy of ‘Lena,’ a shrub rose in the Helena Earth Kind Rose Trial and is shared with the permission of Brian Puckett of the Helena Beautification Board. Vitamin C has also been found to assist in the absorption of iron, making it a helpful ally for overall health, specifically anemia and other iron absorption disorders. Additionally, studies conducted by the University of Maryland Medical Center indicate that vitamin C is also helpful for the production of collagen, an important element in the structure of bones and muscles. This may be related to the findings of another study performed by the Institute for Social Medicine in Berlin. Their findings, published in International Journal of Phytotherapy and Phytopharmacology on February 1, 2010, suggest that the use of rose hip powder can reduce symptoms related to rheumatoid arthritis. Remove the seeds from the hips and add to one pint of boiling water. Pour the boiling rose hip liquid onto 3/4 lbs. of sugar, stirring gently until sugar is dissolved. Store your rose hip syrup in the refrigerator and use as a cough medicine, as well as a tonic or throat gargle. If you prefer taking your Vitamin C in tablet form, consider Beeyoutiful’s Rosehip C. (nutrition facts below). Rosehip C is a big part of our family’s sickness-avoidance regimen and was featured in Staying Well last month. Thanks again to the Helena Beautification Board for the photo of the beautiful rose hip. And thanks to the health researchers who have helped us discover its beautiful health benefits! As a dietary supplement, take 1 tablet 1 or more times daily, preferably with meals. Dicalcium Phosphate, Stearic Acid (vegetable source), Magnesium Stearate (vegetable source), Cellulose and Vegetable Coating. Blogging about our beginning led me to reflect on how our business has impacted our family. Before we were officially launched, we decided to involve our children as much as possible. They listened in on phone calls with city hall while we were learning about business licenses and sales taxes. They watched us count the cost of inventory and office supplies and shipping materials and website subscriptions. They helped us with proofreading and organizing and planning. The whole family has been involved in every aspect of the business including purchasing inventory, advertising, selling, preparing orders for shipment, remitting sales taxes, and renewing business licenses. Two of our children earned school credit for Business Math and General Business. One is presently working on credits for Entrepreneurship and Career Preparedness. Some have been more involved than others, but it has been educational for all. And I don’t see how there can be any better place than Helena to operate a family business. The other business owners in this town have welcomed and supported us and have been an important part of our children’s education and work experience. My son started attending Helena Business Association meetings with me when he was an elementary student, and all of our children have helped at First Fridays. Helena is an awesome place to live and raise a family- and to own a family business. So has owning a business been good for our family? Absolutely! It’s obviously a blessing to have access to great health supplements, and the income from providing supplements for others is a good thing, too. But it’s been really great to be able to introduce our children to the real world of small business with a real business. Thank you, friends, for making all of this possible for our family! This morning, Hewy Woodman (of No Sleep In Helena) led a group of us down on the banks of Buck Creek to see one of the largest stands of Cahaba lilies in the south. 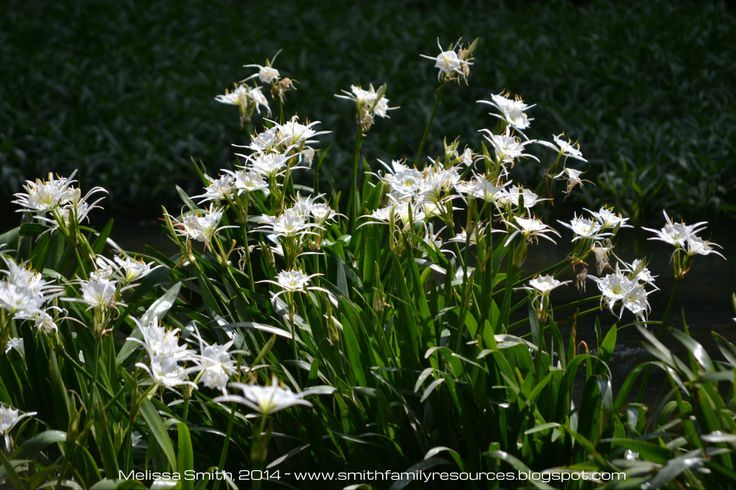 According to www.cahabariver.net, Cahaba lilies are found only in Alabama, Georgia and South Carolina, so I feel grateful to be able to see some here in my own hometown.